Over the last 10 years or so, I've gotten a chance to catch dozens of poetry readings. Often, during the Q & A following a reading, audience members ask the featured poet about poems, writing processes, and getting published. 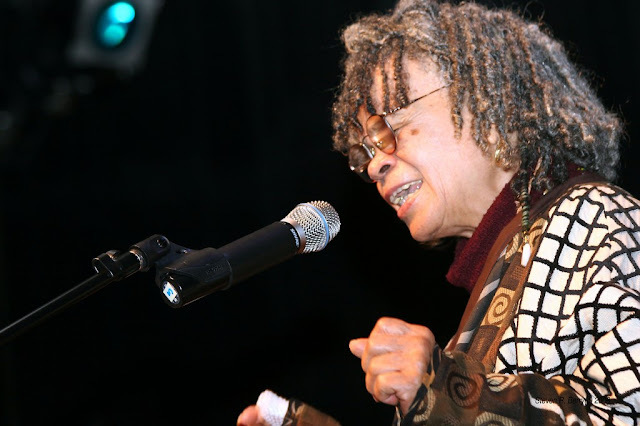 But something typical and unusual occurred during the Q & A on the multiple occasions that I've attended a reading by Amiri Baraka, Nikki Giovanni, and Sonia Sanchez. Rarely do audience members ask those three poets questions about poetry. In the context of poetry readings, that's unusual. But in the context of the readings by Giovanni, Sanchez, and especially Baraka, questions about politics, black history and consciousness, and empowerment are fairly typical. At this point, I would be somewhat surprised if an entire Q & A for those three were devoted to literary questions. The view of Giovanni, Sanchez, and Baraka as figures possessing political or cultural knowledge has been developed and nurtured for more than 30 years at this point. Those poets were leading figures during the black arts era, a cultural movement that urged poets to embrace politics. Larry Neal memorably noted in the afterword to Black Fire that "The artist and the political activist are one." Baraka's and Sanchez's actual poems and comments between readings certainly prompt audiences to consider and possibly raise questions about politics and cultural struggles. Giovanni's poems are not primarily "political," but the extended comments she makes between her poems are often humorous, regularly provocative, and sometimes controversial. Thus, at the close of their readings, people are inclined to ask the poets about their views on an election or ways of combating racism as opposed to more conventional literary concerns. In many respects, audiences pose political and cultural questions to those poets because Giovanni, Baraka, and Sanchez are viewed as kinds of public intellectuals.